From version 2.0 of Google Maps Mobile (gmm), there is this “My Location” feature using A-GPS. How it works is not really explained on the official My Location page. It works with previous GPS and CELLID mappings collected by Google. When gmm users who have had used GPS features in your area, Google collects the GPS co-ordinates and the CELLID associated with it. 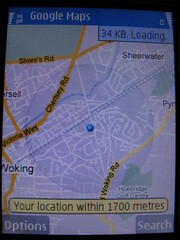 Approximate location without GPS. Google’s commercial & proprietary implementation that has been tried in a couple of open projects. Carriers and operators probably could have made this service a lot better, by sharing the location of the cellular towers. However carriers probably don’t want to do this for several reasons. They don’t want the public to know where their towers are. For competition reasons and probably because they fear they might be embroiled in some sort of “privacy” scandal. So Google’s grass “routes” openstreetmap collection strategy is pushing the boundaries. However this data isn’t public so I expect this collection of CELLID GPS mappings will prove to be very strategic for Google. There is no good reason for Google to share the data and they probably don’t want to taint their “good data” with 3rd party data. I imagine this service becoming quite useful in urban populated areas when done right. GPS doesn’t really work in the city as there isn’t a clear view of the sky, though CELLIDs heavily intersect. Mobile devices sans GPS translates to cheaper and more battery efficient devices. Fantastic. Update: I’ve learnt that the CELLID API on Nokia devices can be very limited. I.e. access to only a single CELLID! So there is no chance of this doing triangulation or being very effective in urban environments! Also I’ve heard some operators charge for cell ID requests. As much as 0.20GBP a request!